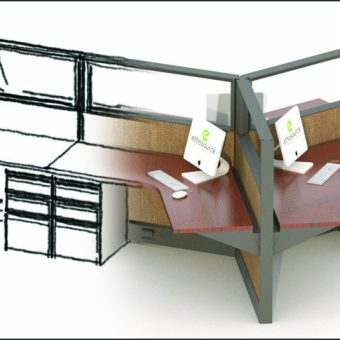 1) Initially the process starts with a couple conversations to help our designer get a sense of the use of the space. Some of the questions often asked are: How many people will be working in the space? What are the needs in terms of privacy/collaboration? What kind of storage and organizational tools would be helpful? Is there room needed for growth? What kind of “look” is desired? Should we value engineer (use as much recycled product as possible)? These questions help us develop a better understanding of the customers’ needs in order to start narrowing down what will and will not work for them. 2) Next, we look at the customer’s space plans. We show them options as to how to maximize their space based on their physical layout and any challenges that the building may present. For example, one option will show that they can get (20) 5’x 5′ stations, and another option will show that they can get (12) 6’x 8′ stations. This phase of space planning can go back and forth a few times before we land on a floor plan that will meet their needs. 3) The third phase involves establishing the necessary details needed to build the stations. This is where we get into the nitty-gritty of exactly what heights of frames, components, and tile elevations are to be used. We present detailed 2-D & 3-D views of the stations to the customer to show which parts and accessories will achieve the design and how the stations will actually look within the space. 4) Lastly, we present all the fabric and finish options. 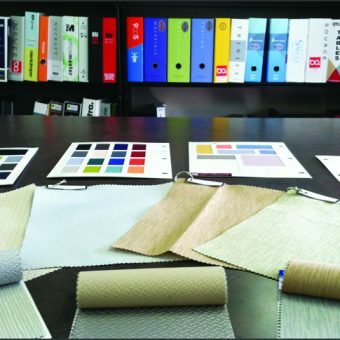 If the customer opts to do as-is, we’ll look through our current inventory and find all available options for fabrics, as well as surfaces, trim and pedestal finishes. Swatches of the pre-owned options will be sent to the customer. If they opt for refurbished product, they will be sent swatches of new fabrics and surfaces that are available. At this point, once finish options start to narrow down, we can then provide detailed renderings, so the customer can see the final result before installation even begins. For more information on our space planning and design services, contact us with your project details!